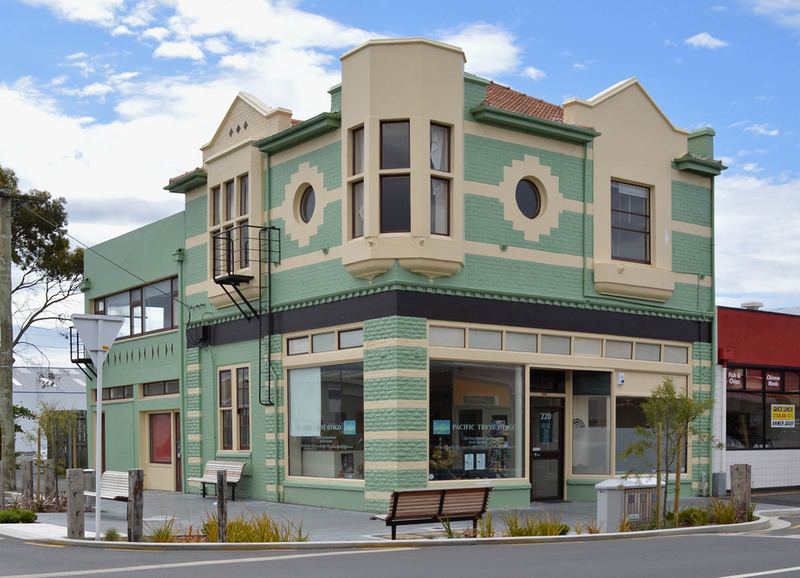 New Zealand’s corner dairies are usually found in modest buildings, and this was one of them, but it was more unusual than most with its Arts and Crafts design by architect Basil Hooper. The building was erected between 1907 and 1908 as an investment property for E.E.C. Quick, who let the shop to the grocer Robert Crawford. Edmund Edward Colston Quick was 70 years old and had lived in Dunedin since 1860, when he had gone into business as an importer. 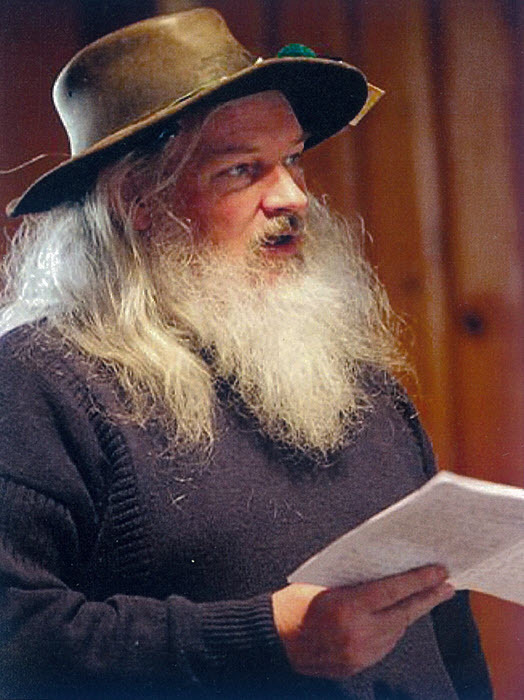 He was well known for his company directorships and community work, including eighteen years served as secretary of the Otago SPCA. 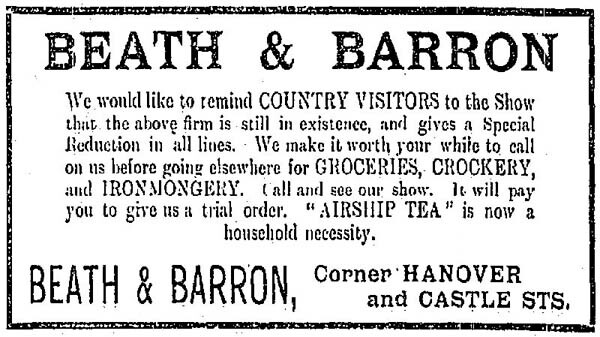 Advertisement for Beath & Barron from the Otago Daily Times, 1 June 1912, p.15. Basil Hooper was apprenticed to J.L. Salmond in Dunedin before he left to study architecture in England. He returned in 1904 as an Associate of the Royal Institute of British Architects, and later described himself as ‘the first young architect to arrive in Dunedin from England, with A.R.I.B.A. after my name, and up to date designs’. He is best remembered in Dunedin for his houses, which include the grand Ritchie residence at 26 Heriot Row. 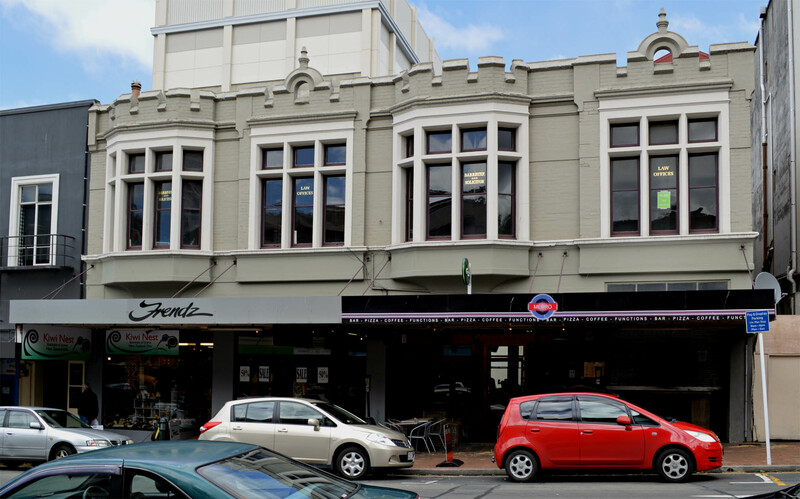 His commercial commissions were less numerous, but introduced elements of domestic Arts and Crafts style strikingly new to this type of building in Dunedin. 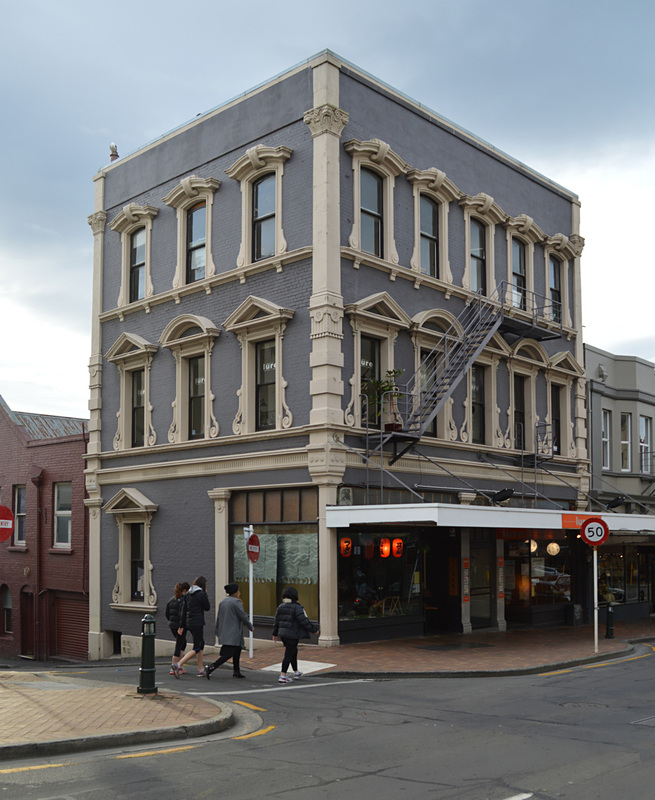 Surviving examples include the George Street Ironmongery Company’s premises (1908) and the Smith & Co. butchery at the corner of King Edward and McBride streets in South Dunedin (1910-1911). 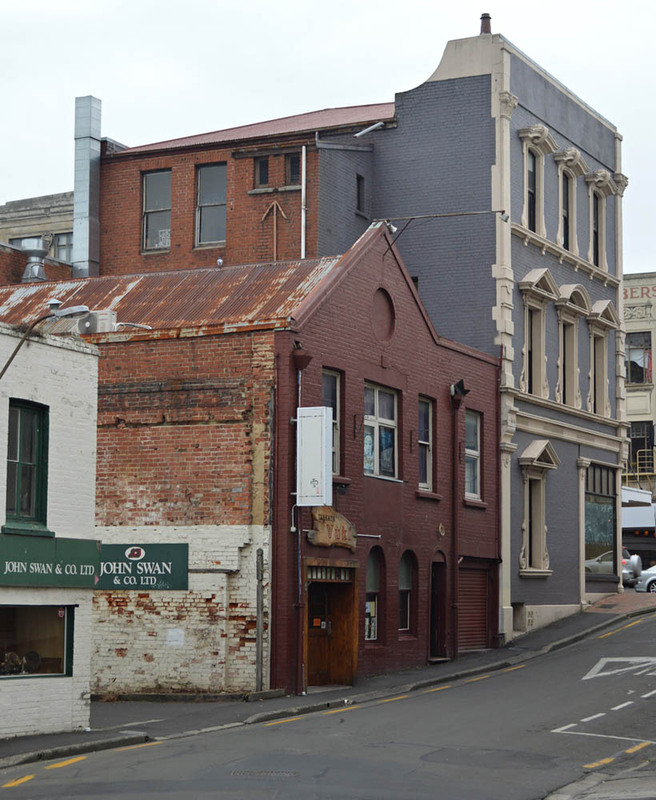 The exteriors of these buildings featured exposed brickwork with Oamaru stone facings, unfortunately now painted over. Quick’s building was also brick, but with roughcast gable ends, and at some later date the brickwork was plastered over. All three buildings featured Marseilles-tiled roofs and their gables were made features rather than hidden behind conventional facade parapets. 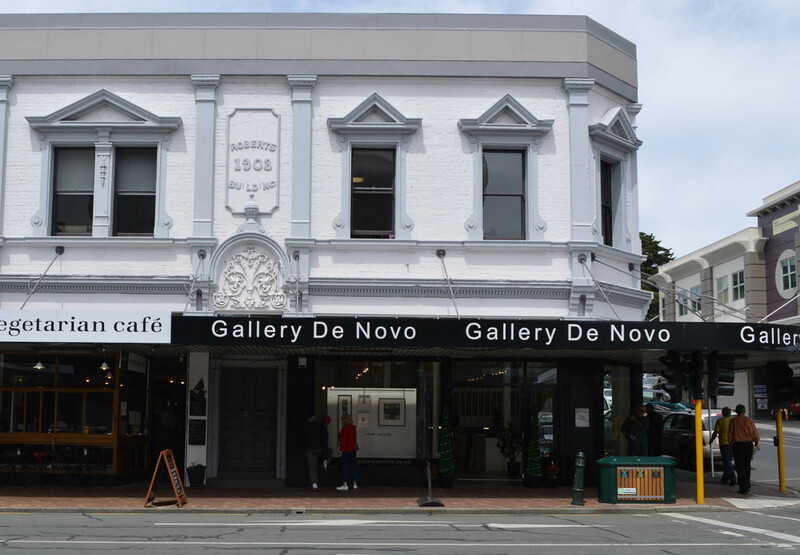 The South Dunedin shop was described when new as ‘modernised old English’, recognising its Tudor influences. Basil Bramston Hooper (1876-1960). Ref: 1/2-197527-F, Alexander Turnbull Library, http://natlib.govt.nz/records/23024841. Former Dunedin Ironmongery Company building in George Street, designed by Hooper in 1908. The brickwork and stonework was unfortunately painted over in the late 1990s. Former butchery building in King Edward Street, designed by Hooper for Thomas Smith in 1910. 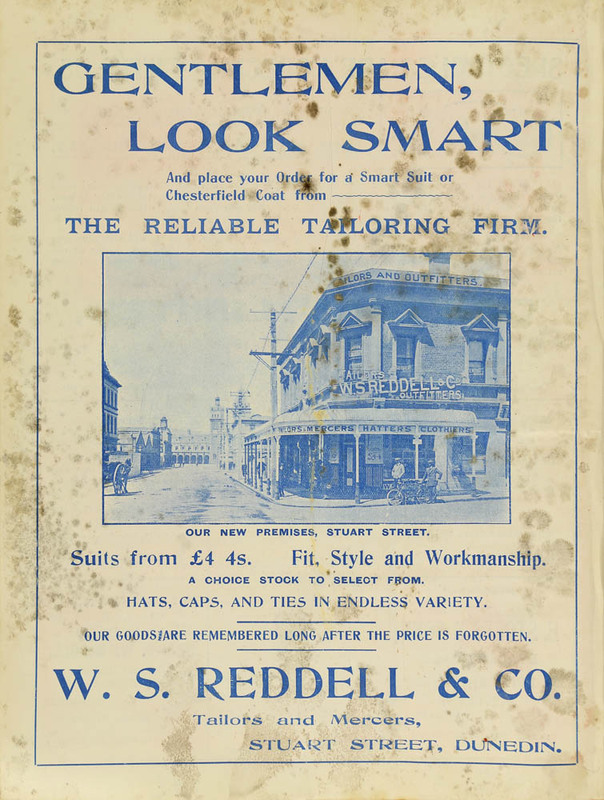 A new shop has lately been completed at the corner of Hanover street and Castle street, to the design and under the supervision of Mr Basil Hooper, A.R.I.B.A. The building is quite unique in its style, as applied to shop architecture, a complete departure from the stereotyped form having been made in this case. In place of the usual high parapet wall and pediments and concealed iron roof, the fronts of the second storey have been formed by a series of gables, with projecting white rough-cast faces. The red Marseilles roof being exposed to view thus blends in most harmoniously with the simple white rough-cast in the gables. A projecting three-light casement bay window forms the centre feature of the Castle street facade, and is flanked on either side by a range of flat casement windows. The shop windows have small panes in the upper portion, and are finished round in exposed brickwork, with a simple brick dentil cornice surmounting the Castle street side. A solid timber verandah, with jarrah posts, shelters most of the two sides. The accommodation consists of a spacious shop, occupied by Mr Crawford, grocer; a large storeroom, stables and outhouses at back, and private entrance hall; and on the first floor a suite of living and bedrooms, bathroom, etc., fitted with every modern convenience. The building has been erected in a most satisfactory manner by Mr John Wood. The building was demolished around 1966, and is today a car park for the bright orange premises of VTNZ (Vehicle Testing New Zealand). It’s difficult to picture the charming little shop that was once there. Many other fine Basil Hooper buildings (mostly private houses) remain and to anyone interested in learning more about them I recommend Ralph Allen’s book, Motif and Beauty: The New Zealand Arts and Crafts Architecture of Basil Hooper. 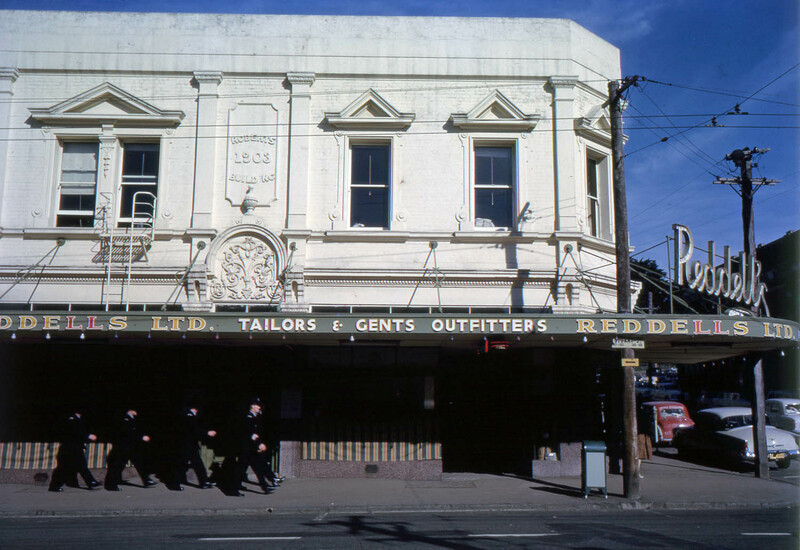 1960s photographs of the store (colour, black and white) taken by Hardwicke Knight. 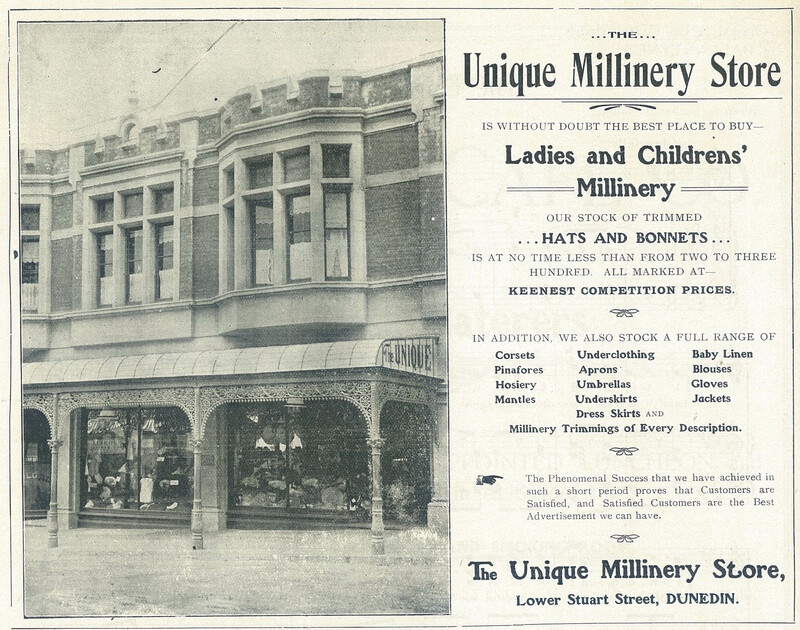 Otago Daily Times, 25 May 1907 p.1 (call for tenders), 1 February 1908 p.13 (description), 18 July 1908 p.6 (description of George Street Ironmongery Co. building), 19 May 1911 p.7 (description of Smith’s building), 10 June 1918 p.3 (obituary for E.E.C. Quick). Allen, Ralph. Motif and Beauty: The New Zealand Arts and Crafts Architecture of Basil Hooper (Dunedin: Harptree Press, 2000). This entry was posted in Buildings and tagged 1900s, Arts and Crafts, Basil Hooper, Castle Street, E.E.C. 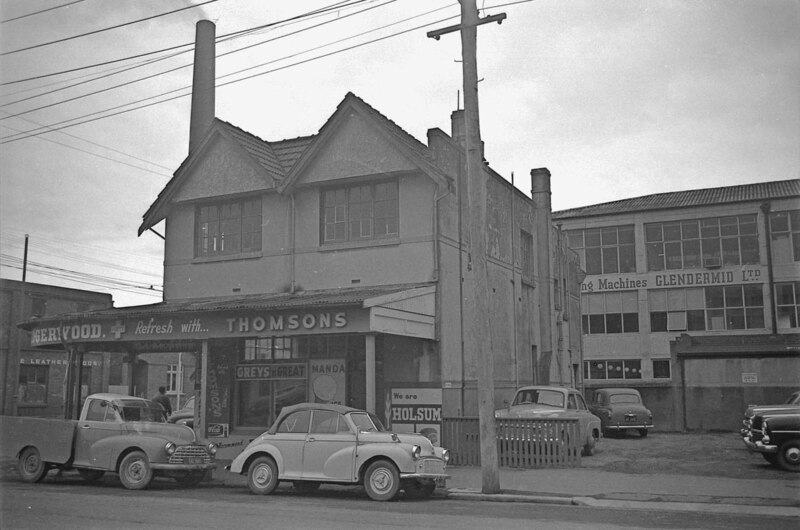 Quick, George Street Ironmongery Company, Grocers, Hanover Street, John Wood, Lost Dunedin, Thomas Smith on 18 January 2014 by David Murray. The building as it appeared in 1910. Toitū / Otago Settlers Museum 63-45-1. The curious name of the Acetylene Buildings is painted above the door in the historic photograph above. 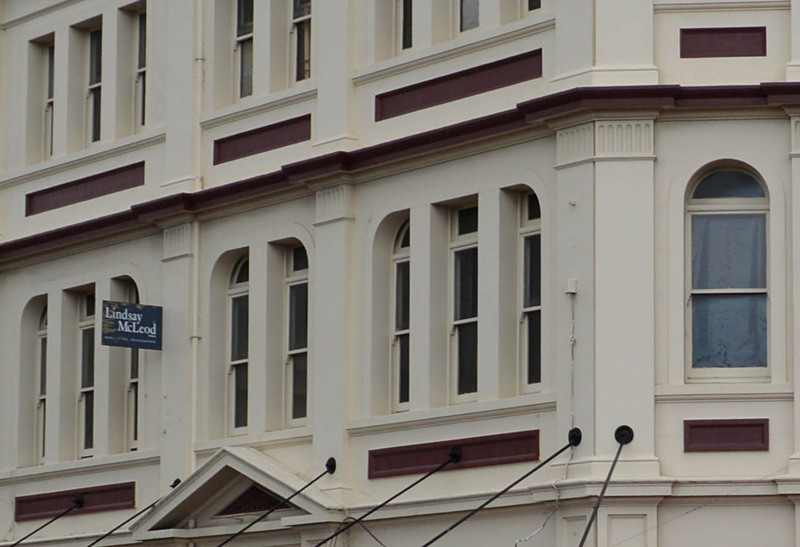 On the parapet and shop fronts is the name of the original building owners, the New Zealand Acetylene Gas Lighting Co. Ltd.
Acetylene lighting became popular in the Edwardian era, particularly for towns or particular properties that were not easily connected to an electricity network. Calcium carbine pellets combined with dripping water to produce the acetylene gas, which was then burned to produce the light. 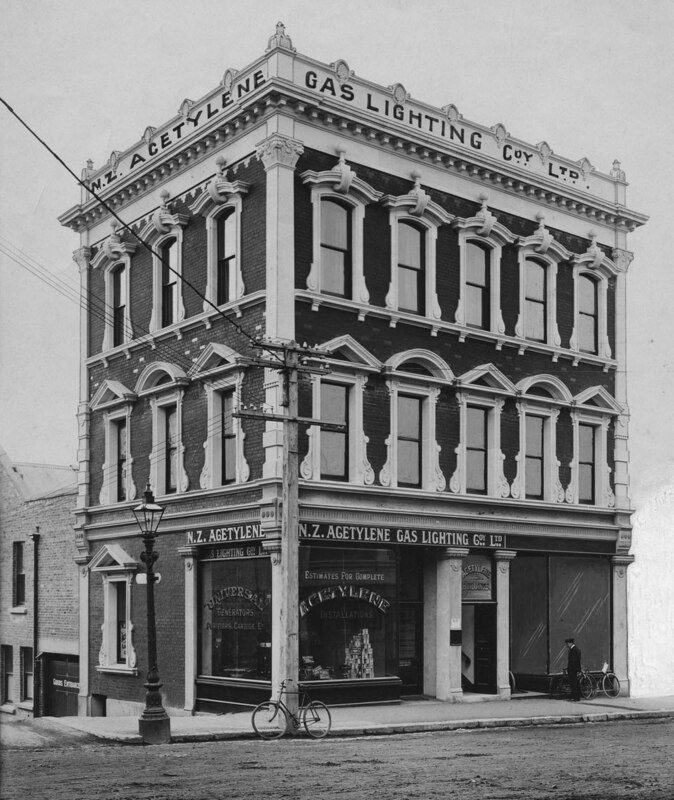 The New Zealand Acetylene Gas Lighting Company was established in Dunedin in 1902, and within a short time branches were operating in Christchurch, Wellington, and Auckland. In 1906 the company was responsible for setting up the street lighting in Picton, the first town in New Zealand to use the system. Kaiapoi and Geraldine followed in 1908, and Opunake in 1909. The company also supplied lighting for private houses such as ‘Aorangi’ at St Leonards, institutions such as Waitaki Boys’ High School, various dredges, and Shackleton’s expedition to Antarctica in 1909. Acetylene cooking stoves and heaters were also sold. A problem with the gas was that it was prone to causing explosions. Eight people were killed in an explosion at a general store at Upper Hutt in 1914. Following a long inquest and vigorous argument, the coroner eventually concluded that gelignite on the premises was to blame rather than acetylene, but the bad press may have hastened the decline of the acetylene lighting in New Zealand, while at the same time electrification was becoming more widely available. The Acetylene Buildings were erected during the boom in construction that came to Stuart Street after the re-siting of the Dunedin railway station. John Arthur Burnside was architect and he called for tenders for construction in September 1909. George France was the contractor and the buildings, which cost £2400 were finished by April 1910. There were three storeys to Stuart Street, with two shops on the ground floor and generously proportioned offices above. An adjoining workshop building faced Bath Street and acetylene lighting was used throughout. 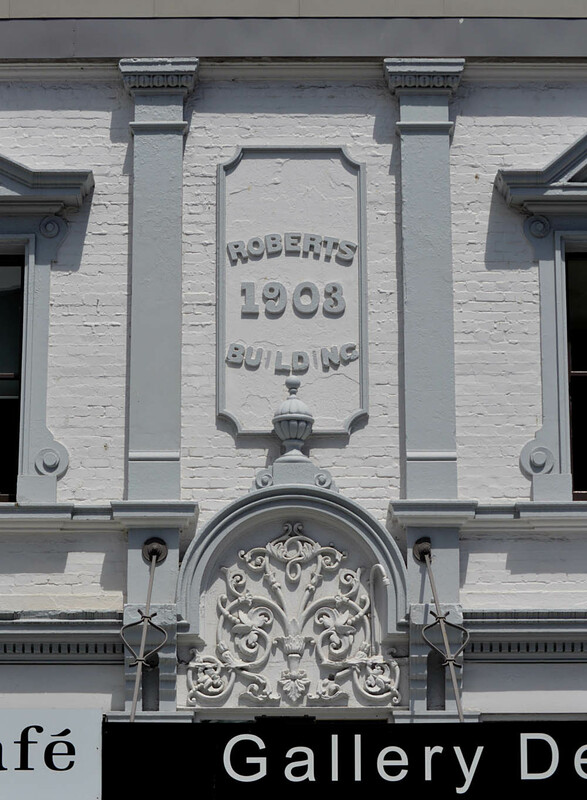 The exuberant Queen Anne styling included prominent window pediments and volutes that echoed those on the nearby Roberts Building, which Burnside had designed six years earlier. 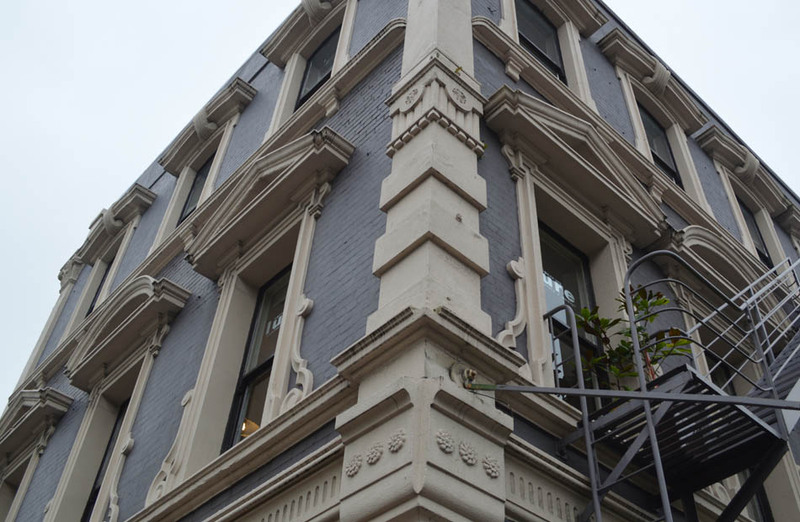 Most of the architectural features remain today, but the parapet detail and cornice have been removed and as a result the composition has lost its balance. The brickwork on the street facades has been painted and a hanging verandah and fire escape added. The Acetylene Gas Lighting Company took the corner shop and workshop. 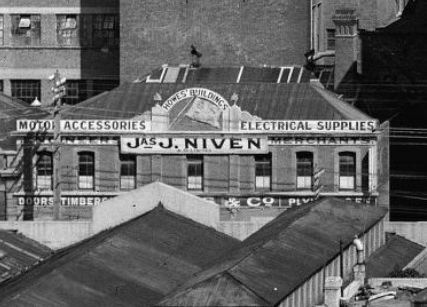 The business was renamed New Zealand Acetylene and Hardware Ltd in 1919, and after downsizing it was reorganised as Electric and Plumbing Supplies Ltd in 1929 and closed in 1956. 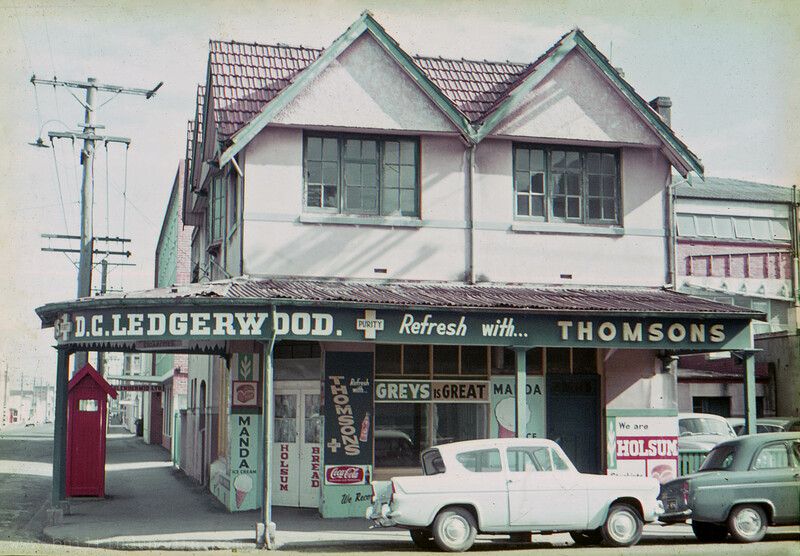 The corner shop was afterwards taken by the Otago Missionary Association, which ran a book room, and then by the Lullaby Fashion House (children’s wear), between 1961 and 1979. Later tenants included Fiesta Fashions and Toy Traders. William James Bell, a hairdresser, had the other shop from 1913. He died in 1955 but Bell’s Hairdressers continued at the address until 1985. Its 72 years came close to matching the record of Hendy’s Hairdressing Room in Princes Street. The former hairdresser’s became a Middle Eastern café/restaurant for a few years and is now combined with the other shop as Minami Sushi Bar and Restaurant (opened in 2002). 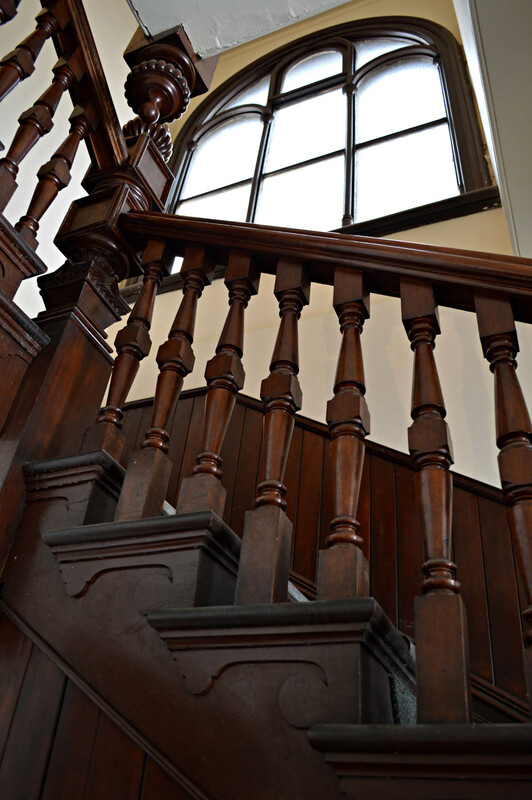 Up the charming timber staircase, its handrail worn to a fine finish after a century of use, is Lure Jewellery Workshop, established by Ann Culy in 1995. There is a great link here with one of the first tenants in the building, Thomas Long. A manufacturing jeweller, he ran his Zealandia Jewellery Manufacturing Company at the address from 1913. Within five years he dropped the company name, but he continued to work in the building to 1929. Lure has workspace for up to four jewellers and its retail gallery represents up to thirty New Zealand jewellers. On the top floor, jeweller and painter John Z. Robinson has had a studio since 1999. Other tenants in the upstairs rooms have included August De Beer (indenting agent, 1913-1932), Chrissie Hall (dressmaker, 1913-1925), Robert Bennet (tailor, 1925-1953), and Bertrand Quelch (barrister and solicitor, 1954-1967). 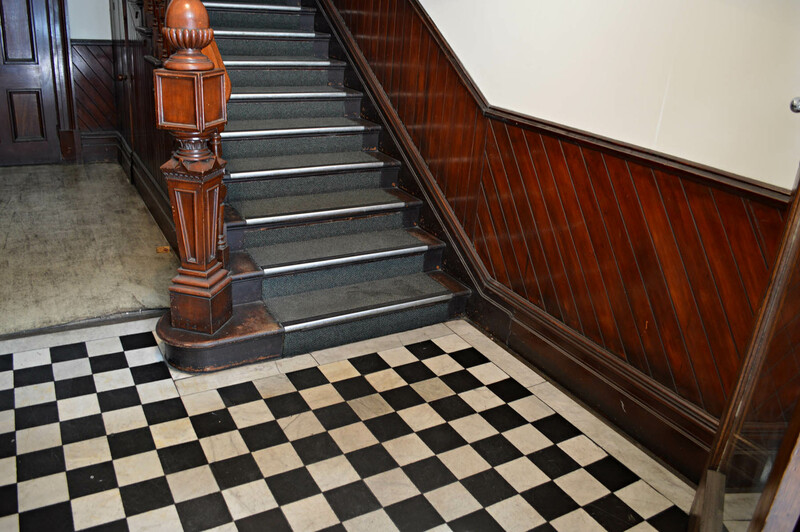 The Otago Chess Club (established in 1884) had its club rooms on the top floor from 1941 to 1955. In those days tournaments were typically carried out in a haze of cigarette smoke. I wonder if the concentration of the players was disrupted by the Dunedin Ladies Brass Band, which had its band rooms in the building for a few years after 1946. Watson Studio, photographers, had rooms on the upper floors from 1962 to 1993, and then became the Gary van der Mark studio. 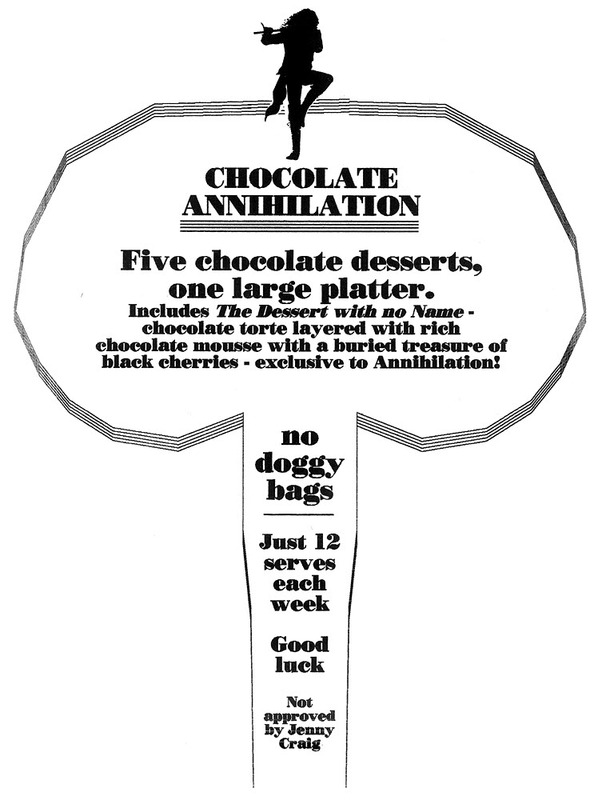 Tull’s Chocolate Annihilation, from the creators fo the Chocolate Massacre. The silhouette of Ian Anderson from Jethro Tull featured on restaurant signage and menus. The old workshop fronting Bath Street became a restaurant around 1987. Smorgy’s and Just Desserts were there for a few years before Geoff and Lois SImpson opened Tull in 1993. Named after the rock band Jethro Tull, it was particularly known for its desserts, and had almost a cult following. Diners were awarded a certificate (‘The Blodwyn’) if they were able to finish the Chocolate Massacre, and other dishes paid homage to the band with names such as Aqualung (a seafood salad) and Bungle in the Jungle (a green salad). The Simpsons were folk musicians and the New Edinburgh Folk Club (established c.1977) met at the restaurant on Sunday nights from 1999 onwards. Tull closed following Geoff’s death in 2006, and since 2007 the space has been a Japanese restaurant, Yuki Izakaya. Tonkin, Keith. The Tull Years 1999-2006. New Edinburgh Folk Club (Dunedin, 2007). Thanks to Lois Simpson for supplying information about the Tull restaurant. This entry was posted in Buildings and tagged 1900s, 1910s, Bath Street, Edwardian, George France, Hairdressers, Industrial buildings, J.A. Burnside, Music, Photography studios, Queen Anne, Restaurants, Stuart Street on 29 July 2013 by David Murray. Builders: G. Simpson & Co.
I’ve posted about a few Lower Stuart Street buildings now and there’s a reason why many of them are from the Edwardian period. The development of Lower Stuart Street progressed apace after the site of the new railway station was finally settled in 1902. It was obvious that a lot of foot traffic would soon be using the street, and it wasn’t long before modest wooden buildings disappeared and vacant sites were built on. Within about ten years a dozen substantial new buildings went up. This one was built for A. &. W. McCarthy Ltd, an old firm of gunsmiths, locksmiths, and fishing equipment specialists. Samuel McCarthy had set up business in Dunedin in 1861, originally as a gunsmith, locksmith, and bellhanger. Sam’s sons Arthur and Walter took over in 1890 and the firm then took on its familiar ‘A. & W.’ name. 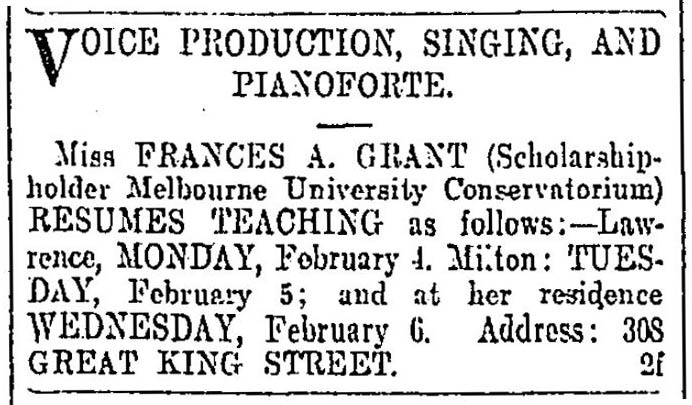 An advertisement from the Otago Witness, 18 January 1894, p.44. McCarthy’s new building went up in 1907. Tenders were called in February and the building was completed before the year was out, with the firm moving from their old premises at 65 Princes Street. The architects were Walden & Barton and the building pairs nicely with the Sweeting’s fish shop on the other side of Stuart Street, which they also designed in 1907. The architecture is a composite Edwardian style that draws from various periods, sometimes loosely called ‘Queen Anne’, and transitioning towards more modern styles. The building is large and handsome and on a prominent corner, yet somehow it manages to be unassuming. It’s sympathetic in scale and design with its grandiose neighbours, the Law Courts and the Railway Station. The gentle curves to the first-floor window surrounds are a nice touch, and pilasters, cornices, and recessed panels give interest to the facades. The pediment above the stairway entrance would have been more prominent before the hanging verandah was added. The building contractors were G. Simpson & Co.
McCarthy’s remained in the building for some 90 years but in its later years the shop itself was moved to the old dairy co-operative premises next door in Castle Street. Five generations of the family ran the business. They became the leading importer of English guns and increasingly specialised in fishing equipment. They were famous for their catalogue service (which even drew in overseas customers) and for a time they had branches in Invercargill and Palmerston North. They had shops and offices in the Stuart Street building, as well as workshops for their own manufacturing department. Children were paid to collect bags of cocoon bodies, which were used to make fishing lures. McCarthy’s fishing reels are now collectors items. Perhaps unusually for a gunsmith, Arthur McCarthy was a pacifist. He studied socialism and Marxism and opposed conscription during World War I. He was a labour movement activist and became national secretary of the United Labour Party in 1912, and later became involved in the Social Credit movement. According to his grandson he had a reputation for having a fiery temper and giving firm advice. Caroline Martin recorded that ‘one of the more colourful stories about A.P. McCarthy involved prostitutes from the Railway Hotel next door who were in the habit of throwing their used unmentionables into the shared courtyard below’. A. & W. McCarthy went into liquidation in 1999, by which time they claimed to be the oldest family-run business in Australasia. The firm’s stock and name were bought by Centrefire, which currently trades as Centrefire McCarthy’s in Moray Place. An immense accumulation of antique stock and memorabilia was sold by auction. 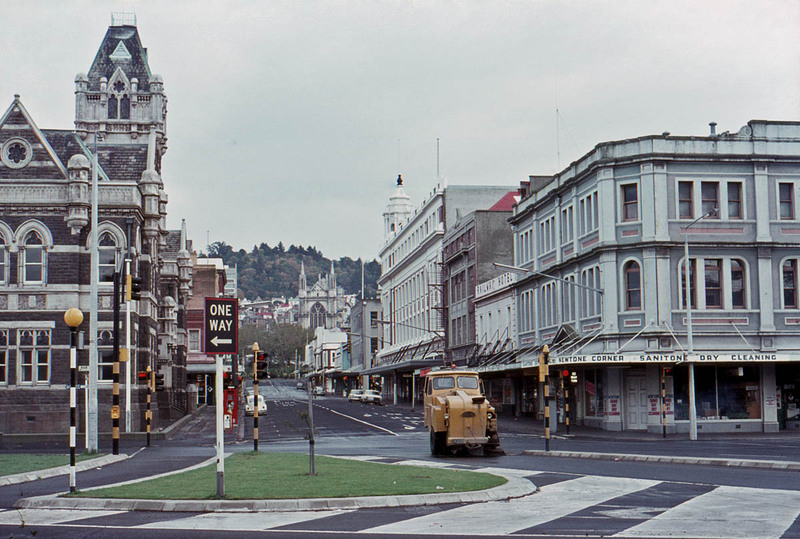 Lower Stuart Street around the 1970s. Photograph by Hardwicke Knight. Many others have leased premises in McCarthy’s Buildings, which originally included six ground floor shops. The fruiterers, Steel’s, occupied the shop at 10 Stuart for 77 years from 1921 to 1988. Upstairs, an unarmed combat training school has occupied the building for the last 75 years. Wrestling teacher and unarmed combat instructor Harry Baldock (1905-1991) moved to Dunedin in 1929 and opened a new gymnasium upstairs in the building in 1938. His school became known as the Baldock Institute. During the Second World War, Baldock was the New Zealand chief unarmed combat instructor and physical training instructor at Burnham camp as well as Forbury and Wingatui camps. He taught national wrestling champions and hosted many visiting international wrestlers. His wife, Iris, was a masseuse and physiotherapist who had worked as a nurse at convalescent hospitals for returned soldiers during the war. In 1973 Geoff (‘Tank’) Todd began training at the Baldock Institute, initially in weight training, physical culture, wrestling, boxing, and Jiu Jitsu, and later unarmed combat. Todd took over the school in 1986 and it became Todd Group, which refocused towards unarmed combat. As of 2013, the group has an instructing team of over 100 instructors and 30 depots worldwide. It also operates a 280 acre 100-man accommodation training camp. Todd Group still runs a gymnasium at 6 Stuart Street. You can read more about their history on their website. In 2005 the Stuart Street Potters Co-operative opened a gallery and shop at no.12. Koru Gallery arts co-operative occupies the corner shop. The exterior of building has changed little apart from the addition of hanging verandahs in 1938. Even the original shop fronts remain; and inside, tongue-and-groove wall linings can still be seen. The building is currently owned by Allied Press. Otago Daily Times, 8 August 1906 p.8 (removal of old buildings), 18 February 1907 p.6 (call for tenders), 11 May 1907 p.12 (description), 24 December 1993 p.13 (‘In the family for 132 years’ by Caroline Martin), 18 May 1999 p.2 (McCarthy’s in liquidation), 18 June 1999 p.4 (Centrefire purchase), 24 June 1999 p.3 (McCarthy’s auction). Accessed from Papers Past (National Library of New Zealand). Colbert, Roy. ‘Generation Game’ in North and South, no.126 (September 1996), p.16; McCarthy, A.C. ‘McCarthy, Arthur Peter (1862-1947)’ in Southern People: A Dictionary of Otago-Southland Biography (Dunedin: Longacre Press, 1998), pp.293-294; 80 Years of Combative Excellence [DVD]. Dunedin: Todd Group, ; Stone’s Otago and Southland Directory; Wise’s New Zealand Post Office Directory; telephone directories; Dunedin City Council permit records and deposited plans. This entry was posted in Buildings and tagged 1900s, A. & W. McCarthy Ltd, Castle Street, E.W. Walden, Edwardian, George Simpson, Joseph Barton, Stuart Street, Walden & Barton on 14 March 2013 by David Murray. 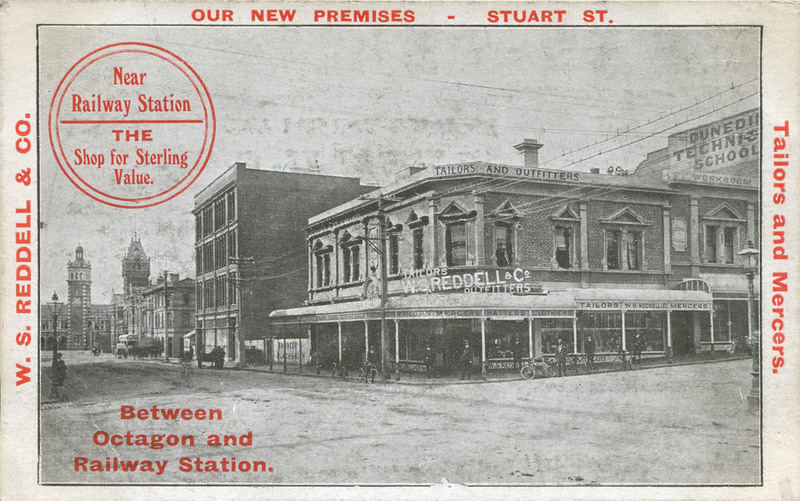 In the late 1800s the site of the building was a vacant one next door to the Dunedin and Suburban Tramway Company (which had buildings on both sides of the street). 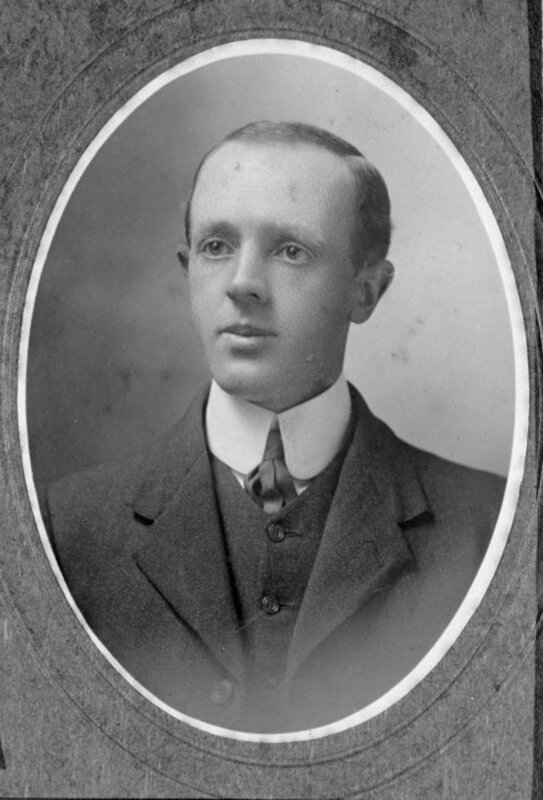 Harry May, of the confectionery firm H. May & Co., erected it as a factory in 1900. It was completed around October that year at a cost of £4,000 to £5,000 for both the building and machinery. It was well appointed for its time and had electric lighting throughout. At the age of 30, Harry May had confectionery shops in both Rattray and Princes streets, as well as his new factory. Sadly, his enterprise ended in tragedy. May quickly found himself in a financial quagmire and took to forging other men’s names to endorse his bills, to the extent that he was later described as a ‘wholesale forger’. On 4 June 1901 he was found drowned at the St Clair baths. He left a wife and three children. 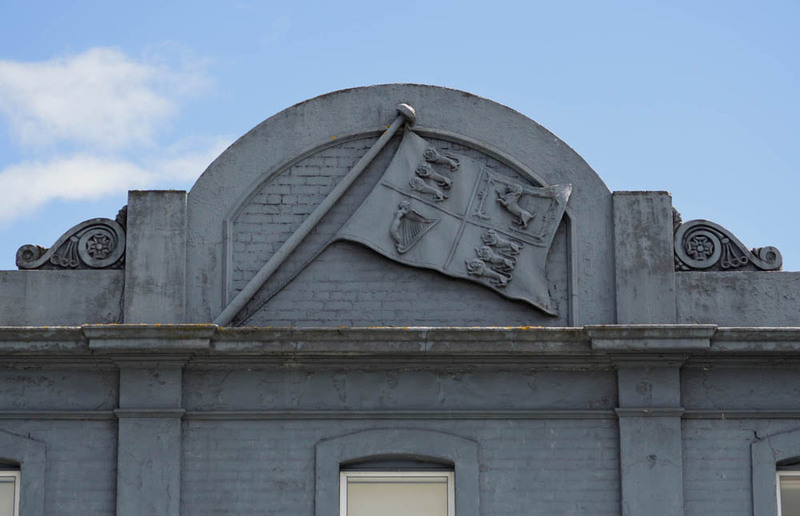 Why the Royal Standard? Its presence is puzzling and it does appear to be an original feature of the building (it can be seen in a 1906 photograph). A likely explanation is that May used it in his branding, and that he chose the symbol for its patriotic appeal at the height of the Second Boer War. 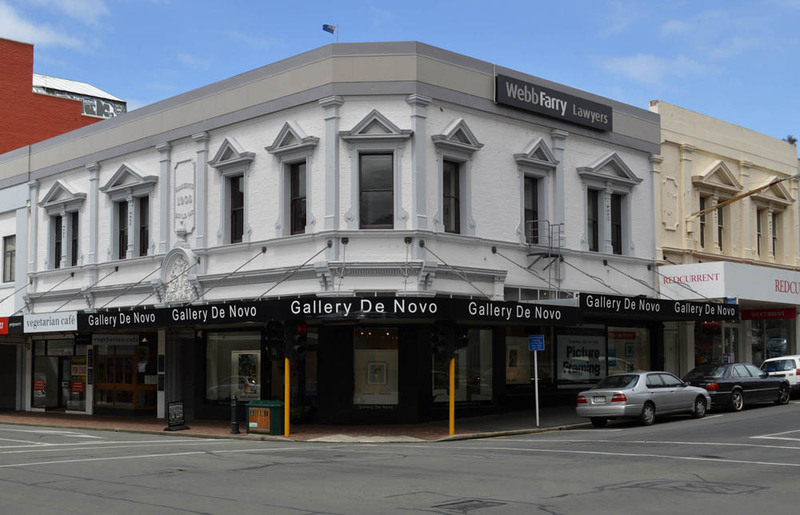 I haven’t been able to link May directly to the ‘Standard’ name, however, Dunedin architect G.W. Gough is named as the architect of the ‘Standard Confectionery Works’ in the Cyclopedia of New Zealand (1905) and it seems probable that this refers to May’s factory. 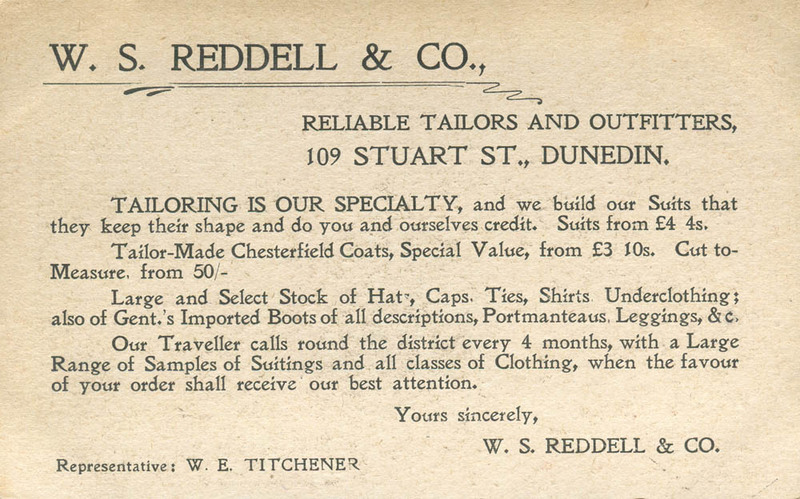 I haven’t found any other Dunedin businesses from around this time named ‘Standard Confectionery’. 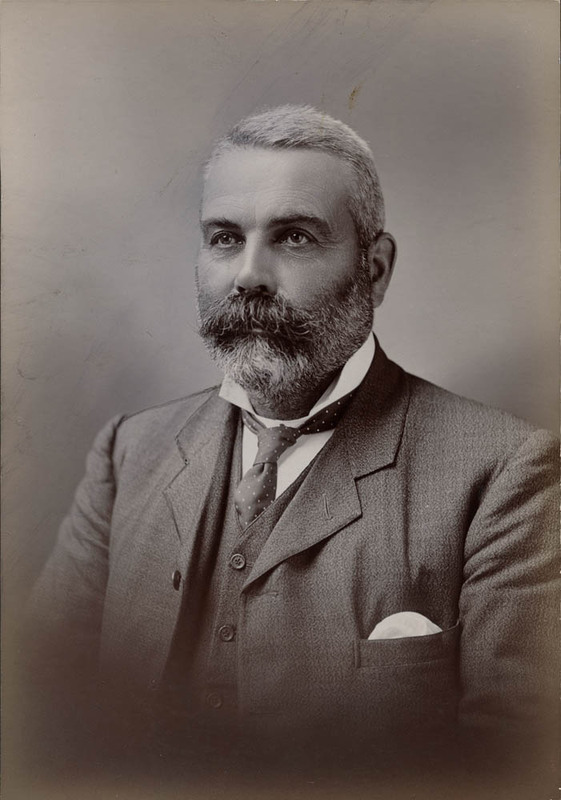 George William Gough (1863-1936) was both a civil and a naval architect, meaning he was often designing boats and ships rather than buildings. According to the Cyclopedia he was born at Manchester and educated at Rothesay in Scotland. He studied naval architecture under the shipbuilders Napier & Sons and Henderson & Co. in Glasgow, and civil architecture with George Melrose in Rothesay. After working in Canada and the United States Gough took charge of an architect and surveyor’s office in Falkirk. He arrived at Dunedin in 1886 where he worked for the engineers and ironfounders Begg & Wilkinson before establishing his own business. Among his ship designs was the steamer ‘Tarawera’, which catered to tourist traffic on Lake Te Anau. His buildings in Dunedin included the Denton Hat Mills, the superintendent’s house in the Botanical Gardens, the North End Boating Club pavilion, and brickworks at Andersons Bay. Some of his drawings survive in the Hocken Collections. The Cumberland Street building is a nicely proportioned if fairly basic example of Renaissance revival design. The use of unrendered brick with contrasting cement facings on the façade is characteristic of the period, although this effect is currently lost as the facade is painted a single shade of blue. Decoration includes a simple cornice, and the pediment with its sculpture is flanked by volute consoles, while two finials have been removed. 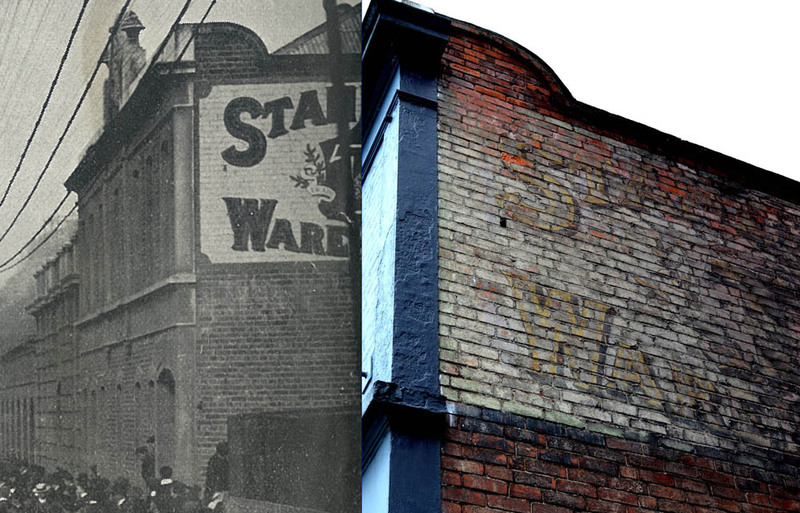 When I took a look into the alley next to the building (where the factory once had an enormous chimney stack), I noticed a faded sign on the wall: ‘Stand….Ware…’. My first thought was ‘ah-ha!’, this is a reference to the elusive ‘Standard’ brand and its ‘Warehouse’. This seemed to be confirmed when I found an early photograph that tantalisingly showed part of the sign. The plot, however, thickened. R. Wilson & Co. took occupancy of the building (under lease) from 1901, as an extension to their Moray Place factory which was used as a ‘complete grinding, sifting, cleaning and mixing plant for treating coffees, spices, teas, etc’. The name of their leading brand of tea? ‘Stand Out’! So the sign is for tea rather than lollies, and for ‘Stand Out’ rather than ‘Standard’. Wilson’s emphasised that their tea was ‘hill grown’ in Ceylon, and that their factory processing was a great advance, as ‘no germs or dirt can get into air-tight tins’. They also ran a coupon competition for many years. Many other firms have occupied the building since then. From about 1919 to 1930 it was owned and occupied by the timber merchants G. Howes & Co. and named Howes’ Buildings. They let part of it to the motor and electrical engineers James J. Niven & Co. A hanging verandah was added in the 1920s, along with new shop fronts. 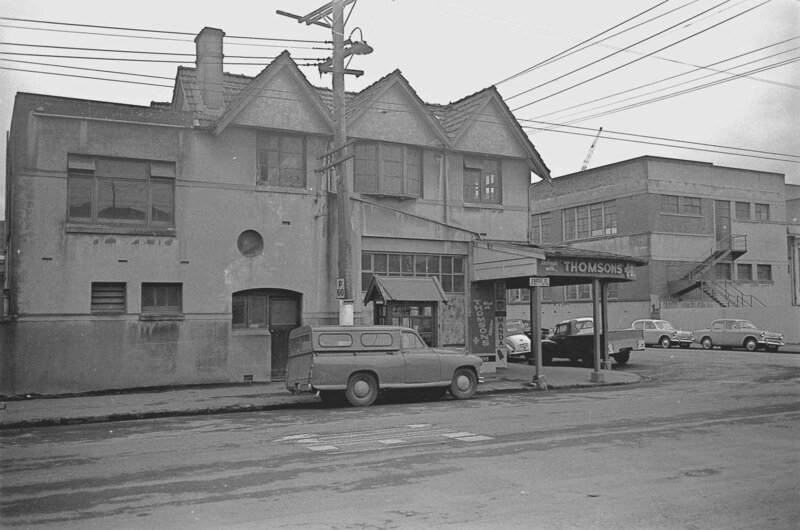 Later occupiers included the Otago Electricity Board and the engineering suppliers Myles Walker Ltd (c.1935-1976). 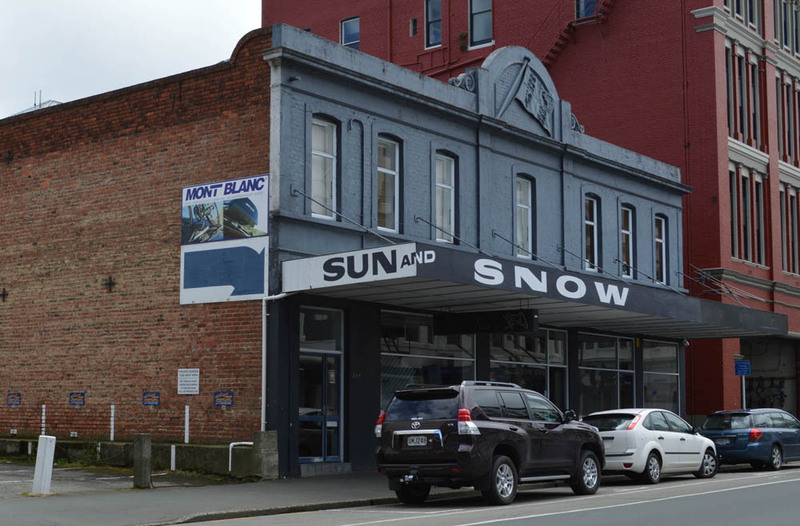 Sun & Snow, adventure equipment specialists, have been in the building since about 1985. Perhaps readers will share memories from these more recent years in the building’s colourful history. The building as it appeared in the 1920s. Note the chimney stack at the right rear. Photo (detail): S.C. Smith. Alexander Turnbull Library. Ref: 1/2-046491-G. Newspaper references: Otago Witness, 12 June 1901 p.40 (‘Sad Death of Mr H. May’); 6 June 1906 p.39 (illustration); Evening Post (Wellington), 26 July 1901 p.8 (sale of buildings); Taranaki Herald, 26 March 1906 p.6 (advertisement); Poverty Bay Herald, 5 September 1906 p.4 (advertisement). Other references: Cyclopedia of New Zealand, vol.4 (Otago and Southland Provincial Districts), 1905; Telephone directories; Stone’s Otago and Southland Directory ; Wise’s New Zealand Post Office Directory ; Dunedin City Council rates, permit, and cemetery records. 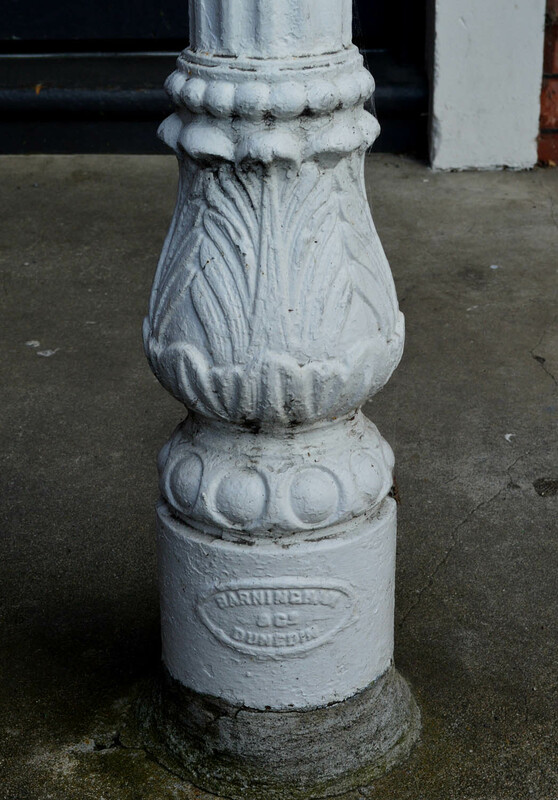 This entry was posted in Buildings and tagged 1900s, Confectionery, Cumberland Street, Engineering firms, Factories, G.W. Gough, Harry May, Industrial buildings, R. Wilson & Co., Renaissance revival, Tea, Warehouses on 23 January 2013 by David Murray. Dr Ferdinand Campion Batchelor (1850-1915) arrived in Dunedin in 1874 and was something of a crusading pioneer in the medical profession here. The lecturer in midwifery and gynaecology at Otago Medical School, he introduced new pelvic surgery techniques from England and America and was an ‘ardent campaigner’ for hospital reform. He commissioned architect J.L. Salmond to design this Stuart Street building in April 1902. 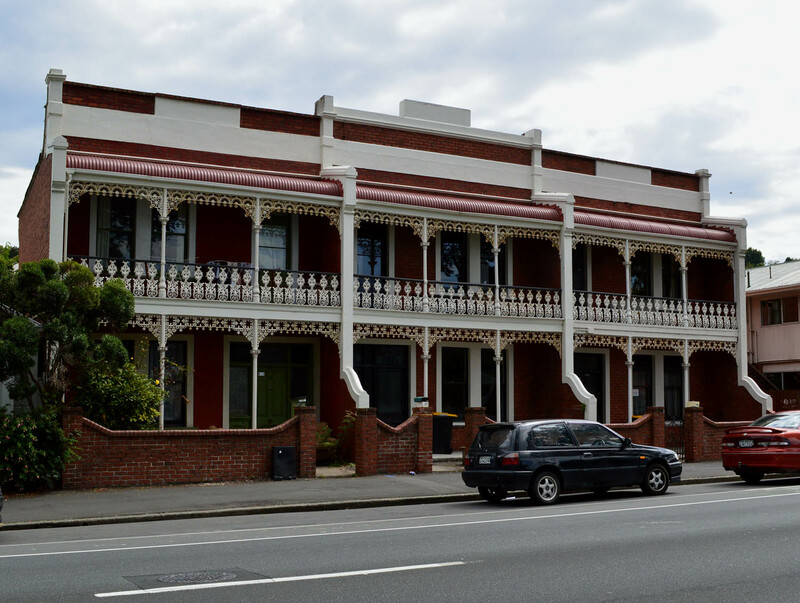 The first floor was to house medical consulting rooms for the large private practices of both Batchelor and his good friend Dr (later Sir) Lindo Ferguson, who has been described as New Zealand’s pioneering ophthalmologist. Ferguson (1858-1948) was a lecturer in diseases of the eye at the university and would later become Professor of Ophthalmology and Dean of the Faculty of Medicine. Batchelor and Ferguson took possession of their rooms in January 1903, before the building was completed. The builders were Woods and Son and the contract price (June 1902) was £2,596. In addition to the doctors’ rooms, a third consulting room was let to Swindley Bros, dentists. Also on the first floor were two nurses’ rooms, two waiting rooms, a dressing room, a laboratory, and a dark room. The last was for Batchelor, who was among the first in New Zealand to use x-rays in private practice. A balcony at first-floor level ran the length of the rear of the building, from which a curious attached timber structure containing toilets was accessed. This survives in largely rebuilt form. The ground floor comprised three leased-out shops, the original tenant of two them being the Unique Millinery Stores (Dorothy Reinhardt, proprietress), with the other taken by Crombie & Co. (tailors). The fall of the land means the rear wall of the building has an additional basement level. Stuart Street c.1903. 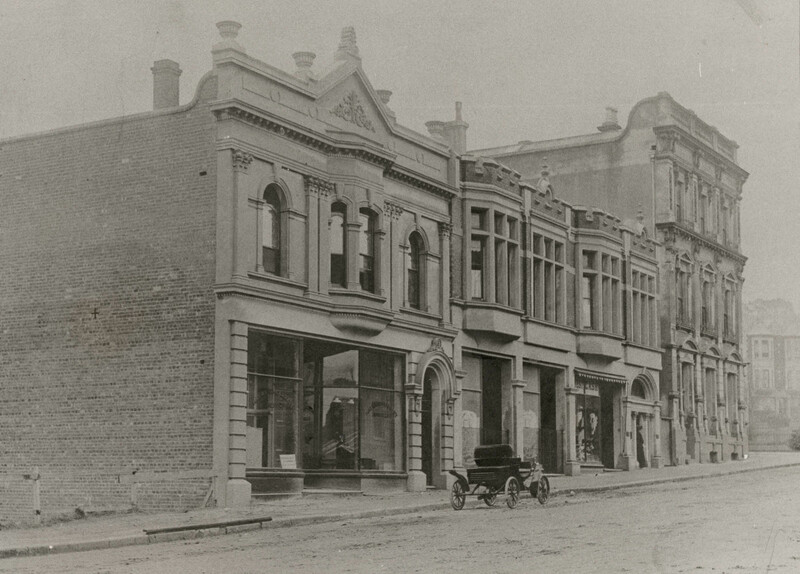 The building at the left was completed just a few months after Batchelor’s building and was also designed by J.L. Salmond. It survives but had been stripped of its ornamentation. An advertisement for the Unique Millinery Store from ‘Corrigan’s Fourth Annual. Music Album for 1906’. They boasted of never having fewer than 200-300 hats. The store relocated c.1923. Batchelor served in Cairo during the early part of the First World War, where he was Consulting Surgeon and responsible for efforts to control venereal disease among New Zealand troops. Sadly, he returned to Dunedin in broken health and died of heart failure during a walk in the sand dunes at Tahuna Park on 31 August 1915. The maternity hospital in Forth Street was afterwards renamed the Batchelor Hospital in his honour. Dr Stanley Batchelor took his father’s old rooms and kept them until he died in 1942, while Ferguson occupied his rooms until about 1938, by which time he was in his eighties. Among the many medicos and dentists who had rooms in the building over the following decades was the celebrated surgeon Sir Gordon Bell. 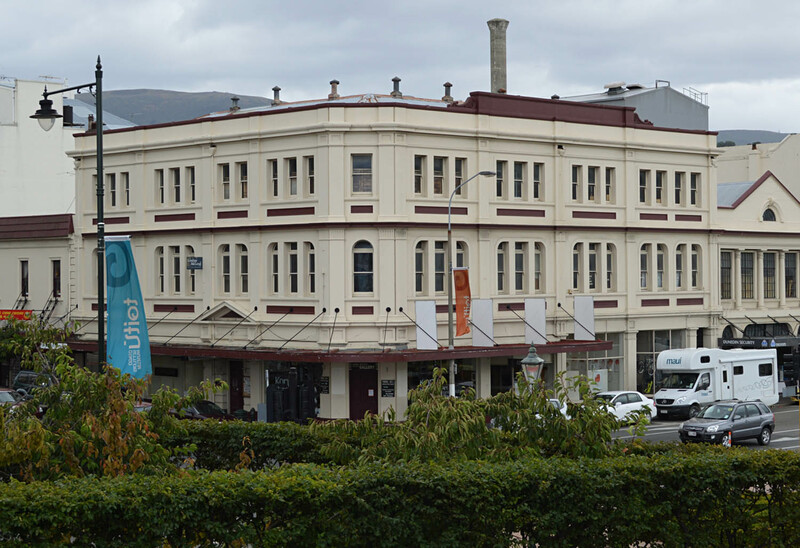 The building became the headquarters of the Otago-Southland Manufacturers’ Association around 1971, when it was renamed Industry House. The Association left around 1983 and the first floor has since been used as legal offices, notably by David Brett and Michael Guest. Guest’s offices were here at the time he defended David Bain in his 1995 murder trial. 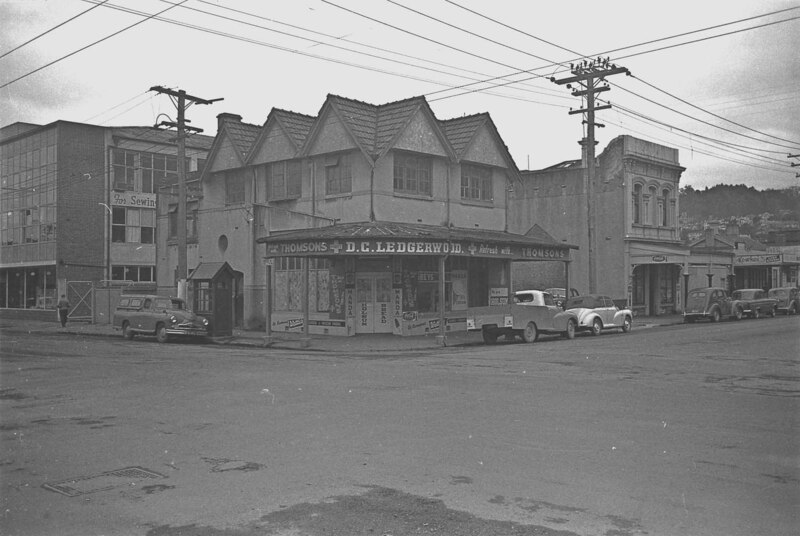 The many ground floor tenants have included the Unique Stores (c.1906-1923) and Dunedin City Dealers (c.1955-1976). This floor is now occupied by Frendz Boutique (women’s fashion) and Metro bar (which also uses the basement). 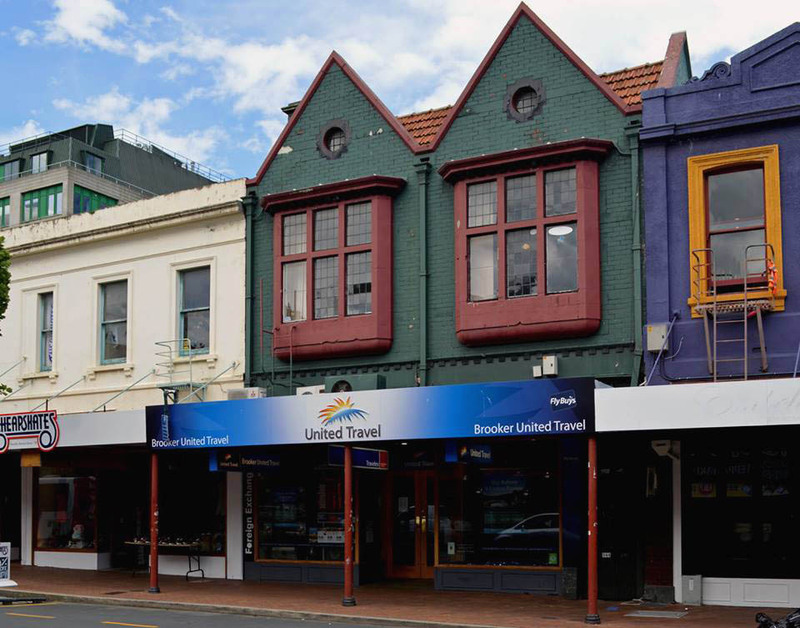 This is one of few Dunedin commercial buildings in the Tudor revival style. The spare treatment includes oriel windows and a castellated/crenelated parapet (the latter built instead of a slightly plainer parapet with recessed panels shown on the drawings) and the arched ornaments may be a direct reference to Burghley House (Cambridgeshire, England). The brick and cement work on the façade was originally unpainted. 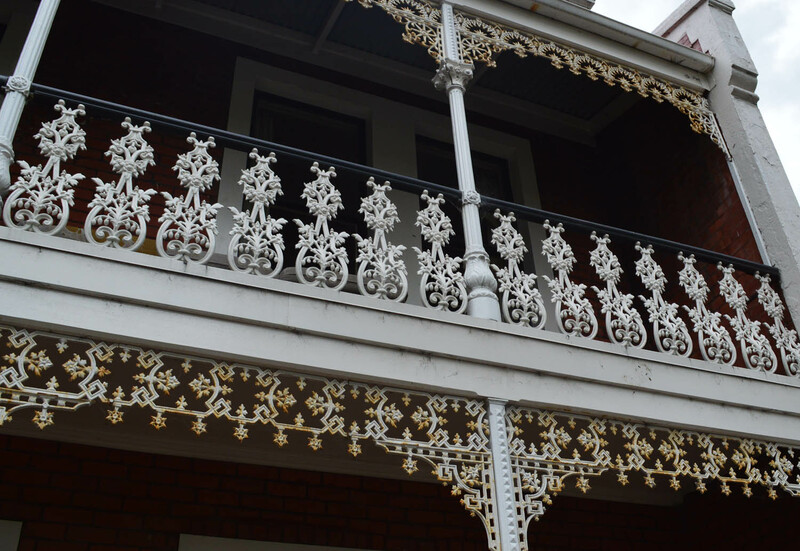 A bullnose verandah with decorative posts and cast iron fretwork was added in 1904 and surviving plans suggest it was intended originally. It ran the length of the shop fronts but not the entire façade. It was later replaced by a hanging verandah running the length of the façade. Alterations have extensively altered the shop interiors and fronts and the original arched entranceway to the upstairs rooms has been replaced. The vestibule itself retains many original features as do the first floor interiors, including tiling (sourced through Briscoes), tongue-and-groove wainscoting, balustrading, a staircase feature window, plaster corbels, and other decoration. The building’s architect, James Louis Salmond (1868-1950), was born in England but grew up in Dunedin and attended Otago Boys’ High School. He was apprenticed to Robert Arthur Lawson and opened his own office in 1893. He went into partnership with his old teacher, Lawson, and later with Newton Vanes. His most familiar designs include Threave (Watson Shennan’s house at 367 High Street), Burns Hall at First Church, Roslyn Presbyterian Church, and Queen’s Building. His practice was later continued by his son, grandson, and various partners, before it finally wound up in 2008. Elegant and understated, Batchelor’s Building is a fine example of his work. This entry was posted in Buildings and tagged 1900s, Daniel William Woods, Doctors, Edwardian, Ferdinand Campion Batchelor, James Louis Salmond, Lawson & Salmond, Lawyers, Lindo Ferguson, Milliners, Tudor revival, Woods & Son on 10 November 2012 by David Murray.